University of the Arts London is located in London and is Europe’s largest specialist art and design university, offering an extensive range of courses in art, design, fashion, communication and performing arts. Our graduates go on to work in and shape the creative industries worldwide. 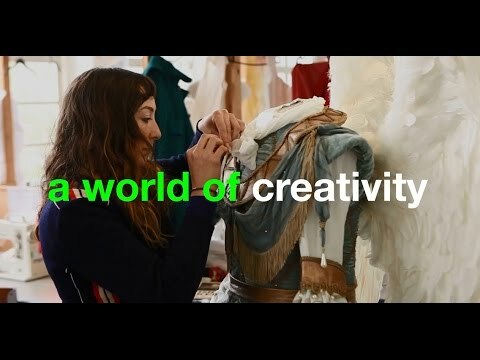 UAL is ranked second in the world for Art and Design in the 2019 QS World University Rankings®. The University offers students pre-degree, undergraduate and postgraduate courses ranging from fine art and 3D animation to graphic design and drama. You can find out more about studying at UAL, our subjects and explore our courses here. UAL students have access to state of the art facilities, including workshops with letterpress machinery, studio theatres and gallery space. Students can also make use of the University’s libraries and archives for research into hundreds of years of the greatest artists and designers. You can find out more about the University’s Colleges here. UAL’s inspiring teaching faculty is made up of professional artists, practitioners, designers, technicians, critics and theorists, all on hand to deliver cutting-edge programmes and courses. The University dominates when it comes to fashion education with two of the world’s top four undergraduate fashion courses taught at UAL Colleges according to the Business of Fashion (Bof) Rankings in 2017. UAL was rated ‘Outstanding’ by Ofsted in 2017 for our Foundation Diploma in Art and Design. The University has a world-class reputation and is made up of 6 equally renowned Colleges: Camberwell College of Arts, Central Saint Martins, Chelsea College of Arts, London College of Communication, London College of Fashion and Wimbledon College of Arts. Click the following videos and images to expand. UAL offers a wide range of scholarships, bursaries, awards and hardship funds provided through generous donations from individuals, companies and philanthropic charities, as well as from University funds. Each year hundreds of students realise their creative potential at UAL thanks to funding. Use our Scholarships Search to find out if there's a fund for you. To begin to meet the eligibility criteria for our International Postgraduate Scholarships, you must have applied to study a course which qualifies for a scholarship funding. Halls of residence are available to all students who have been offered a place on a course at UAL. Students should pick their top five halls of residence when applying. We will try to place you in one of your top five halls, but we cannot guarantee this will be possible. Please make sure you send in your application early to avoid disappointment. Applications from international students, disabled students and those under the age of 18, will be prioritised. Please notify us of any special requirements you have on your accommodation application. Foundation year students work on a different timetable to most other courses but they are still free to a book a place in halls. Find more information at UAL accomodation services. UAL is committed to developing and promoting opportunities for both students and staff to study and work abroad as part of their University experience. We also welcome incoming exchange students and staff who want to study or train here. Erasmus+ is the European Commission's education programme for UK education, training, youth and sport opportunities across Europe. The Erasmus+ programme aims to boost skills and employability, as well as modernising Education, Training, and Youth work. A number of our programmes provide opportunities for UAL students to study or undertake a traineeship abroad as part of their studies. We offer English language development for UAL students who speak English as an additional language. The Language Development Programme will help you with the academic language and skills you need to be successful on your course. Language Development tutors work closely with UAL courses to make classes and tutorials relevant to your needs. See how we can help with your studies and have a look at our Language Development blog for more information about our latest courses and tutorials. In our libraries you can access outstanding collections in art, design, fashion, communication and performing arts. You can also make full use of our study spaces, technology and academic support. There is a library in each of our Colleges with staff who are happy to help you make the most of our resources. Read more at library services.